SADDLE MOUNTAIN.....Sec. 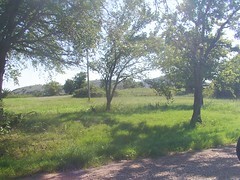 31, T5N, R16W......Located 16 miles south of Mountain View near the south edge of the Kiowa County line. Store was a small general store and a fourth class post office. Some customers came to the store at 5 or 6 A.M. as they started their days work, others stayed till midnight. Domino games near the big coal heater in the winter were a big part of life there. The store went out of business about 1956. 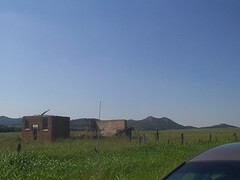 16 miles south of Mountain View on OK highway 115, to Saddle Mountain Store or Junction of OK 19 and OK 115 turn south on OK 115 go 2 miles store on right side of road. Behind the Saddle Mountain Store was this large flock of wild turkeys. You can just see their heads above the grass. 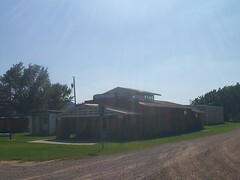 On highway 115 south of the Saddle Mountain store is this old school building. Location from insection of Ok 19 and OK 115 turn right onto OK 115 go 8.1 miles School is on right side on curve.